Abnormal cysteine levels in vivo are related to cardiovascular disease, Huntington's disease, HIV infection and cancer. Cysteine is a common reducing agent in many in vitro experiments. 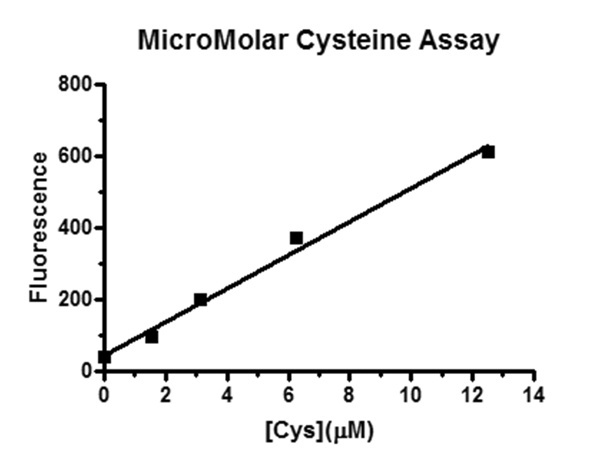 The MicroMolar Cysteine Assay Kit (Catalog number CYS200) is designed for measurement of micromolar concentrations of cysteine. The assay is based on increase of fluorescence at 535 nm of the dye R53 in the presence of cysteine. The assay kit can be used for measurements cysteine concentrations in biochemical reactions, pharmaceutical products and environmental water samples. The MicroMolar Cysteine Assay Kit (catalog number CYS200) provides the reagent for measurement of 200 samples using 96-well plates. Cuvettes or 383-well plates may also be used for measurements. The assay is compatible with HEPES buffer. It is not compatible with other thiol compounds such as DTT. For measurement of DTT, see the information of MicroMolar DTT Assay Kit (Catalog Number: DTT200). Wang LJ et al, Increased serum levels of cysteine in patients with schizophrenia: A potential marker of cognitive function preservation. Schizophrenia Research (2017).